Perhaps the best way to describe my pages is "a little touch of fantasy." Do you remember when you were a child and believed anything was possible. Well, I still believe. I hope that you enjoy the little pieces of magic that still touch my soul. You'll see them in the following pages. 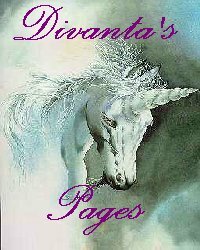 So close your eyes and dream of unicorns, dragons, and faeries... (ALL the images, the poetry/stories seen in these pages should be considered copyright of the original artist/authors. If you know who they are, PLEASE email me so that I may give them credit for their work. I thank them for their wonderful talents!!!!) I now invite YOU to step through the portals of time. Back...back to an earlier age, when the magic of fantasy was reality. Some how I lost the border on this table.. any clues?? EMAIL ME WITH YOUR COMMENTS. VIEW MY ARCHIVED GUESTBOOK 2!! PLEASE feel free to send me your comments or leave them in my GB. Isn't there a dreamer in all of us?